Last Wednesday at "Cookies, Conversation and More" book discussion group at the Henderson County Public Library, Suzan Tisdale, a best selling local author wowed a crowd with her story of how a local girl became famous. Growing up in Kirkwood and Monmouth areas, Suzan had been writing stories for years to fill time but had never sent anything to a publishing house. Things changed when she received a Kindle in 2010, a whole new world opened. She went from buying books to reading them to deciding to write one for her Mom and download it onto a Kindle for her birthday. She really hadn't read romance novels before, but after her mother suggested one about Scottish clans, she was hooked. Arising at 3 a.m. to write, she labored on her story. Researching online and with the help of the local librarian who ordered books on Scottish history, food, weapons, etc. 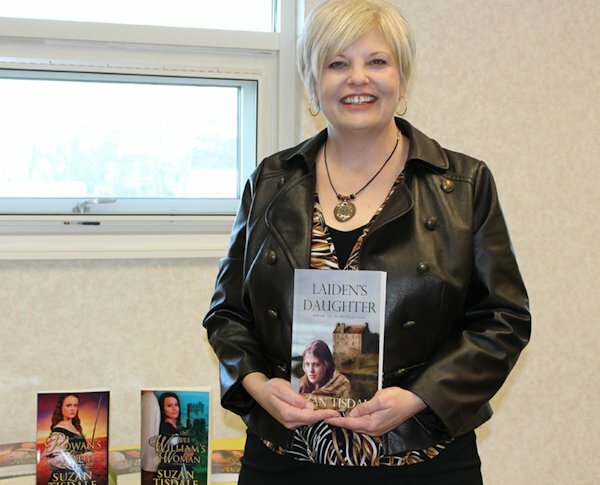 from mostly universities in the Alliance Library System, she wrote her first book, Laiden's Daughter, historical fiction about the Clan MacDougall. Now to transfer it from the computer to the Kindle-her husband researched the method and they discovered an Amazon direct publishing promotion for e-books. Two months later Laiden's Daughter was No.1 on Amazon's best seller list and by February over 10,000 copies had been sold with her readers demanding "more." Her life has now changed drastically. She left her day job of selling insurance to write full time. Along the way she has acquired an editor, an assistant, an accountant, a formatting team joined by a street team of other authors and hired professionals as needed (this day she was headed for Monmouth for a photo shoot for the cover of her next book). She has branched out in a big way. Amazon has partnered with Warner Brothers to create Amazin Studios. AmaIn made the announcement and Suzan has pitched her movie to Warner Brothers through Amazon. With a possible movie or TV series she is learning to write a screen play from McKenna's Honor. She has found an incredible actor to produce audio versions of her books and of course, these will be available on Amazon too. When asked how she comes up with her stories, she said she hears them in her head and can picture the scenes; otherwise, hear it, see it, write it. For covers, originally she persuaded family members to dress up in period costumes from the Costume Truck in Peoria for a photo shoot with a professional photographer and some still volunteer. How does the business end of this adventure work? After trying other e-book sites as well as bricks and mortar stores with limited success, she uses Amazon exclusively. Day or night she may check sales: how may books sold by day, week or month. Worldwide she has sold over 200,000 copies and currently, her first book is being translated into German with an audiobook developed in that language. Her readers in Scotland are urging her to visit and that might be in her plans for 2015. Marketing is done via accounts on Facebook and Twitter as well as a Facebook party when a new book is released. She doesn't buy ads and relies on "word of mouth" to add to sales too. Here in the United States she has attended author conferences in Las Vegas and St. Petersburg and may attend one in Denver this year. An exchange of ideas and connections are invaluable. When asked about her personal heritage, she shared that her mother's family were Scot-Irish gypsies and her father's grandfather was the first American citizen in that family. How does she develop her characters? Readers will find similarities in her immediate family; for example, her heroes are modeled after some aspect of her quiet, stoic, tech smart husband. She remarked about how much she has learned from her own children so they too appear in her books. This busy lady likes to read or listen to books when she is not in her office writing most days from 7:30 a.m. to 1 or 2 p.m.
She also is an involved mom of teenagers and married children. She currently is a trustee on the village board of North Pekin, Illinois. Susan's advice to would-be authors, "Everybody has a story in them; you just have to sit down and write." Be sure to attend the next Cookies, Conversation and More book discussion group at the Henderson County Library on the third Wednesday each month at 10 a.m. Challenging topics will be discussed; bring a friend.